Denver cop-turned-bookseller Cliff Janeway’s fourth case takes him to far-off Paradise, Colorado, where cops and crooks alike are as infernal as the weather. Years after taking Erin D’Angelo’s lover from her via seduction and marriage, Laura Marshall has killed the guy. At least that’s what she told the cops on the scene: “I shot Bobby.” Even though Parley McNamara, her lawyer, is already doing his best to stanch the damage, Laura wants Erin, a Denver attorney, to lend a hand. So Erin sends Cliff, her partner in Twice Told Books, out west to talk to the jailed widow. While he’s waiting for Laura to open up to him, Janeway, who just can’t help going the extra mile, has time to antagonize Lennie Walsh, the troglodyte sheriff’s deputy who made the arrest; pull long shifts standing watch over the Marshall home, filled with books signed by their celebrity authors, until a shifty pair of alleged book dealers turns up; and run interference so forcefully for the Marshalls’ adopted son Jerry when he suspects that the mute 11-year-old’s been abused that he ends up in stir himself. 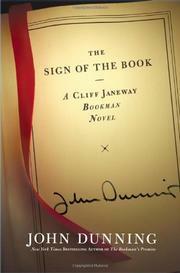 The clever mystery is neither dense nor twisty enough to rank with Dunning’s best work (The Bookman’s Promise, 2004, etc. ), and the final revelation is one too many. But Janeway is as resourceful as ever, and the usual irresistible asides on the book trade will make this the most enthusiastically hand-sold title of the season.